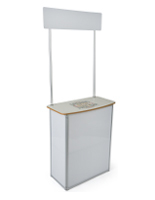 A promotional counter is an ideal display for product demonstrations, distributing samples, and other point of purchase applications. 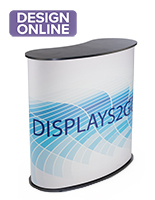 This promotional counter, also known as a demonstration counter, makes a great addition to any trade show exhibit, traveling presentation, or in-store display. Designed to be lightweight and portable, this promo stand weighs just 18.5 lbs and neatly folds into its own carrying bag. 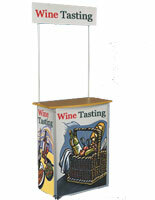 At 30-3/4" wide and 77-3/4" tall, each promotional center will easily fit into any exhibit booth. 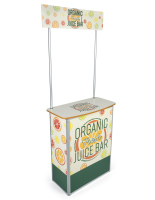 This promotional counter just takes minutes to setup and requires no tools for assembly. 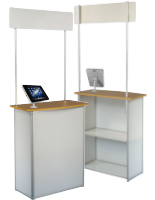 A promotional counter, such as a promotion stand or trade show counter, offers a great reception point at marketing events and exhibits. This promotional counter is made of lightweight materials and features a blank header to attach your own sign or graphics. The header connects using two poles that slide through holes in the countertop and keep the display stable. 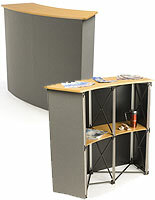 Two internal shelves are included to give the promotion stand support and provide storage space. This demonstration center is made of corrugated plastic with an aluminum frame. The aluminum frame gives the promotional counter extra support, and makes it 3x more durable and stable than the "all plastic" counters typically found in the marketplace. A wood-colored laminate countertop also allows this promotional center to hold about 150lbs (on the countertop). Each shelf can hold about 10-15lbs of evenly distributed weight. Product appears just as shown in photos and description. Panels are of a lower end slightly transparent coroplast with a thin aluminum framing. Probably good indoors for short term usage. Header is made of 3/16" gator type board which easily warps if not kept flat. The top is a prefabbed printed particle board. 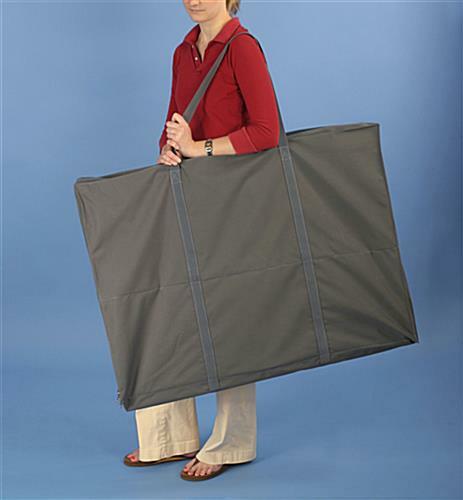 Biggest quality for some reason is the travel / carrying case that this product comes in. Overall for what i am using this for it probably is worth the money. Wish there was a higher end version of this display as an option though. Thank you for your feedback, Andy! We've sent it along to our product development team to review. We're always looking for ways to improve, so we appreciate your input! Thanks so much for shopping with us and taking the time to let us know what you thought. 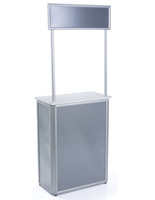 This stand es perfect to any event that you have and convenient because you can move it very easy and fast ensamble. You're making us hungry over here Leo! Glad you are happy with your booth and thanks for sharing a photo. Very light but very strong! So easy installation. My client loves it. Thanks for the review, Taesoo! We are very pleased with this product. It's not designed for those seeking a permanent counter, and it serves as our mobile box office. It moves easily, the set-up is easily done and it has a nice appearance. 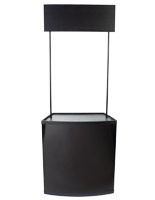 I would recommend this to anyone needing a temporary but elegant setting. We'll use your company again. I was happy to find out that there is portable counter such as this in the market. I like how light it is and easy to carry around. One thing was unsatisfied with is its size. I wish it was a little bigger. Hi Jennah, Thank you for your review.